Why choose the HYDROPACK® tray to green a steep roof? 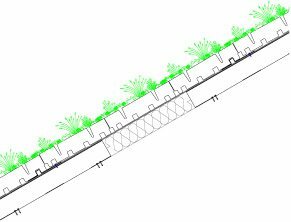 The HYDROPACK® tray brings together in one module all the components of the multilayer planting systems (drainage, filter, growing medium, and plants). The numerous compartments located at the bottom of the tray allow a permanent water reservoir to be created, beneficial for growing plants, as well as for retaining rainwater on the roof. 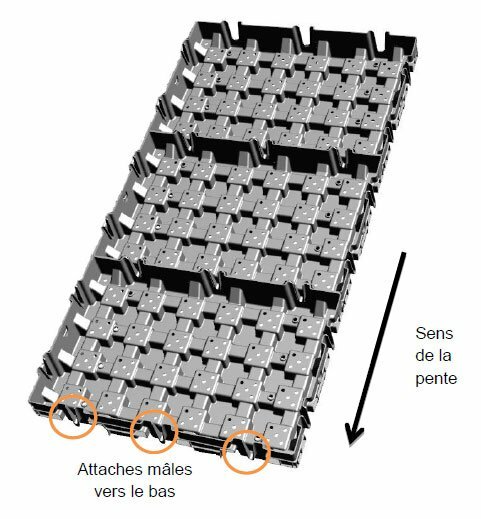 The trays are perforated (500 holes/m2) at the top of the compartments, i.e. at a height of 30 mm above the waterproofing membrane. So, once the compartments have been filled, the excess water joins the channels for draining water to the RWI (rain water inlet) points. 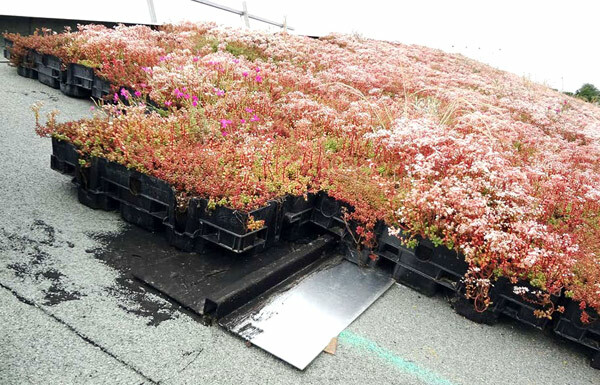 The all-in-one format of the HYDROPACK® tray is particularly well suited to projects for greening steep roofs where using multilayer solutions can be complicated. The HYDROPACK® tray avoids erosion of the growing medium and the vegetation: its walls create a partition between the growing medium and the vegetation, and the plants which have been grown previously in the nursery for 8 months, are firmly rooted in over the whole depth of the planted system. So there is no risk of the growing medium and the vegetation eroding when it is installed. Specification for Installation Instructions for the HYDROPACK® tray was issued after the system was approved by a Technical Inspection Service. The HYDROPACK® tray has a connecting water reservoir which facilitates and optimises satisfactory distribution of irrigation water over the roof. This water reservoir is complemented by the installation of an irrigation system. Each planted zone on the roof must have a water connection whose output is suitable for the surface area of the roof. Vegetal i.D. has developed watering solutions to suit every type of surface, whether flat or pitched, as well as aesthetic expectations. These devices are perfectly placed among the plants so they are difficult to see. The ACROPACK® anti-slip retention devices are fixed to the load-bearing component, or even to the load-bearing structure, through the layers of waterproofing and insulation installed by the waterproofing company. They are arranged perpendicularly to the pitch. The ACROPACK® anti-slip retention devices have been designed to make sure that the seal is not broken around the fixing devices. A retention device is systematically put in place at the bottom of the pitch. It consists of an openwork retention device. The bottom of the pitch can be finished either by a curb with flashing, or a runner with an overhanging gutter. The HYDROPACK® trays are placed on the waterproofing membrane after installing the retention systems. They are fixed to each other using hooking systems arranged around the outside edge of the trays. The trays are installed from right to left and from bottom to top. The second line is placed immediately above the first one, and so on. The trays must only be positioned horizontally (longer length perpendicular to the pitch) and with the male attachments pointing downwards in order to respect the water’s direction of flow. The HYDROPACK® trays can be cut to follow the shape of the roof. If the HYDROPACK® system is used for planting an area, no separation device between the trays and the no vegetation zone is required. The no vegetation zones can be eliminated under certain conditions (see Professional Regulations). Nevertheless the area around the rainwater inlets (RWI) must be kept clear by creating a no vegetation zone of at least 40 cm wide. The HYDROPACK® planting process on a steep roof can be installed either directly by the roofing contractor, or, with the latter still retaining responsibility, one of the roofing contractor’s co-contractors or subcontractors (which may be a landscaping company). Vegetal i.D. can then install the system. The choice of the method of fixing the retention devices to the load-bearing component, as well as determining its dimensions to comply with the loads applied is the responsibility of the waterproofing company. It is the job of the waterproofing company to fit the retention devices to the load-bearing component. The company supplying the roof framework must determine all the loads to be taken into account and the dimensions of the load-bearing component. These loads are made up of permanent loads, working loads and their weightings. When retention devices are used it is difficult to calculate snow load and this must be the subject of a special study to be conducted by the company responsible for the roof framework.